Bouquets of yellow tulips and pink tea roses. Silk stilettos in light lavender. Floppy calla lilies atop a pearl white cake. Grapefruit martinis served in pink, sugar-rimmed glasses. 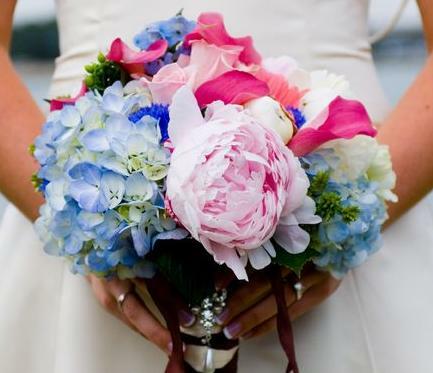 Spring weddings are full of pastels, thin fabrics, sweet breezes and fresh blooms. Book your biggest day during the most revered wedding month, even if you’re planning while there’s still snow on the ground. Springtime always equals outdoor wedding receptions, right? Well, not exactly. April can be just as rainy as it is gorgeous and there’s no way to tell if you’re going to get sunshine or sun showers. 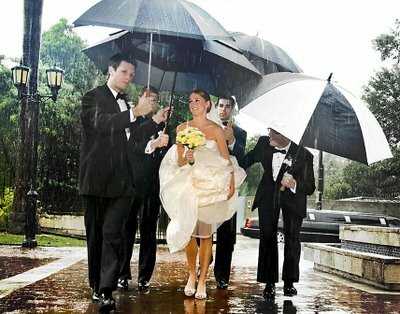 Unless your maitre d’ will shoo everyone inside a pre-set ballroom should it start to thunder, it’s better to plan an indoor wedding. Need your dose of fresh air? Have just the ceremony outside – chances are the weather will hold out for 45 minutes. Or, set up a tent outside so that you can still get that bright, airy atmosphere without panicking over a few raindrops. Want a Springtime color theme that looks feminine without being too pretty-pretty-princess? Pick one light pastel and mix it with a deeper color. Think mint green and deep pink or pale yellow and navy blue. Take a walk outside to get inspired by the natural foliage of the season. For a vintage, garden-esque feel, opt for various muted pastels and neutrals. Spring is the most popular time of year to get married, which means that if you don’t book your vendors at least one year in advance, you’re going to be stuck with the bottom of the barrel. Before you find the perfect bridesmaids dresses, centerpiece florals and your something blue, book your photographer, videographer, DJ, caterer, baker and limo driver. You can’t have a wedding without a first dance & cake to playfully smush in each other’s faces, can you? Blooms from Bali sound nice, but they’re going to A) cost you a fortune, B) not last forever & C) be forgotten by your guests 24 hours after the reception’s over. Consult a florist to find flowers that are in season, native to your geographical location & complement your wedding colors. Even if money’s no object, you’ll have wilted petals if it takes your florals a long journey to ship. Also, make sure that the bouquets’ stems are wrapped in quality fabric. Otherwise, the color could bleed through and ruin your wedding gown or the bridal party dresses.